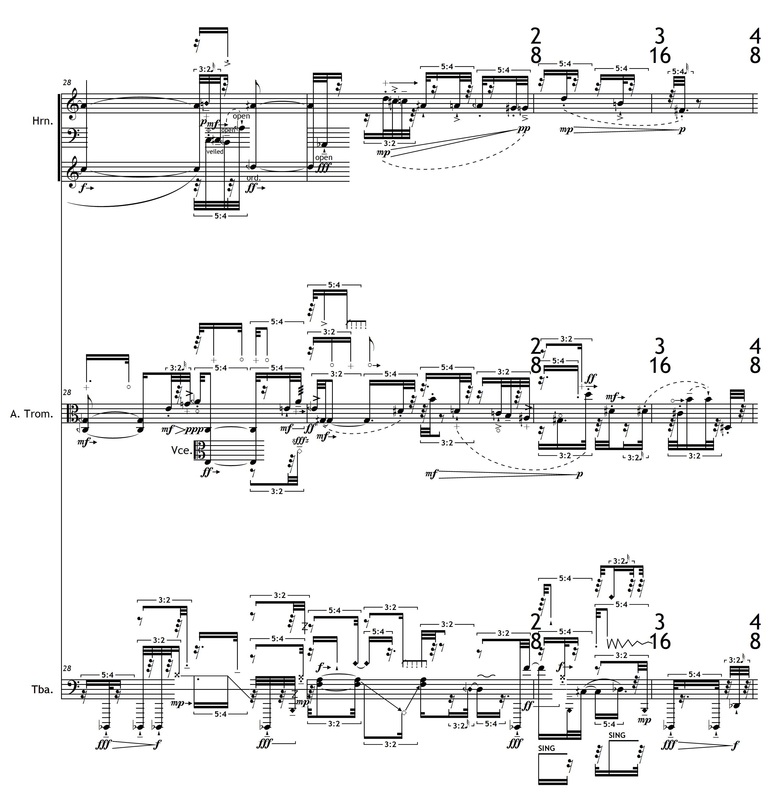 Performed by Ensemble Apparat on October 3, 2015 at the Akademie der Künst in Berlin as part of Ensemblekollektiv Berlin . Premiered by Ensemble Apparat on September 5, 2014 at Villa Elisabeth in Berlin as part of their Science Fiction Double Feature. The Fantastic and the Impossible: I appreciate science fiction’s capacity to bring impossible worlds to light; to enable the incapable. My own work deals with extreme difficulty and instability to explore personal boundaries, both mine and my collaborators’. This common purpose was in the forefront of my mind throughout composition. The Shrike: The Shrike is a recurring character from Dan Simmons’ Hyperion cantos. It is an unstoppable killing machine with uncertain motives. I am fascinated by the Shrike’s incessant, methodical pursuit of its target: there’s an inevitability to its grim purpose that captures my imagination. This ceaselessness influenced the work. The Borg: Star Trek’s man/machine hybrids are notable for their collective consciousness: to be made Borg is to lose one’s self-identity. Differences are neutralized in support of a supra-being. Brass instruments’ inherent timbral similarities suggest to me a similar subjugation of the individual voice. Each may be treated as an imperfect substitute for the other, a proxy, standing in for one another to create a composite. Here, the ensemble speaks simultaneously, as one and as many, in a ragged fashion betraying the difficulties of merging together. My gratitude to Max Murray, Fabian Schmidt, Samuel Stoll, and Ensemble Apparat for the opportunity to bring these two very different worlds of mine into a dialogue. I am forever appreciative of their interest, eagerness, and investment.